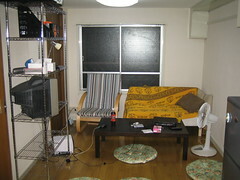 On Friday, 2006-06-09, the movers came to move the furniture from the apartment in Fukuzawa to my new place in Oyamadai. Officially I was able to move in from June first, but I wanted to move as much as my stuff as possible before making the actual move. I also needed some time to prepare for the move, so I waited until the 9th to make the big move. Over the week prior to the move I made two to three trips on my little bicycle from one place to the other. Each trip takes about fifteen minutes, and there is a fairly large hill in between the two so either way half the trip is pedaling up a hill, and the other half is braking down the hill, trying to avoid hitting people on the sidewalk. Over the course of the move-in, I've probably made about twelve or thirteen trips between the two places on that little bike. It is a great bike. It can fold in half, and I recently put a basket on the front just for cases like this when I would need to move things around in it. Sadly, it is a bit small, and even with the seat as high as it can go, I can't stretch my legs out far and long trips on it are quite uncomfortable. Still, I get the feeling that if everyone in America rode a bike as much as I ride that little bike, we wouldn't have a national obescity epidemic. Of all the things in my apartment, probably about twenty percent of them by volume arrived on my bike or in my backpack. That doesn't sound like much, but if you go by item count instead of volume, that number rises up to about eighty percent I think. I really have gotten a lot of mileage out of that little red bike since I bought it early last year. Thanks to my friends Eric and Tai, I was very lucky to be able to receive a lot of furniture and appliances. I received a refrigerator, microwave, rice cooker, washing machine, television, and things like that. I also got some of Eric's furniture for compenstation that has yet been determined, but it really was useful for me because I didn't have to worry about buying furniture for my apartment, I only had to worry about moving it. Of course, since I am the worrying type, I still did plenty of fretting and worrying, but in the end it all worked out. The one thing that I was worried about was Eric's bed. For some reason, he bought the most monsterously large bed he could find, it was 200cm long by 140cm wide. Now that I've moved to Japan, I've become more used to the metric system, but the bed is about 4.6 feet by 6.5 feet. I took measurements of the door and staircase, and in general the bed would fit, but I wasn't sure if it would be possible to get the thing around the corners of the staircase. The movers were good at their job, it took only two hours to pack things into the two (small by American standards) trucks, and unload them into the new apartment, but when it came to the bed they just could not get it up the stairs. So I had to do something with that bed. I couldn't just leave it out on the street, because that would be breaking all sorts of rules. Usually you have to pay to have large garbage taken care of in Japan. Luckily the movers would haul the bed off, but I had to pay them about $140 to do it. It is a real shame because the bed was very comfortable, and only about a year and a half old. Even worse, I had to buy a new bed, but of course I made sure that the new one was small (a single) and that the frame could be disassembled so it could make it up the stairs. It should arrive in a week. Until then, I'm sleeping on a futon on the floor, with a few blankets folded up for extra padding. On my last trip to the Fukuzawa apartment, my bike picked up a thumb tack in the rear tire, and it went flat. 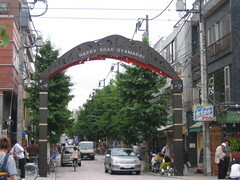 I had to walk the poor thing back to Oyamadai. I didn't think this would be much of a problem though because there is a cute little bike shop right on the main street where I should be able to get the puncture fixed. I went down to the main street, but the bike shop was closed. Since it was noon, I guess the owner must have been out to lunch or something. So, back to the apartment for a while to unpack. Returning later, the bike shop was still cloesd. I went next door to the Diving Shop, and spoke to the owner there. He said that the bike shop next door was open randomly, would often shut down business for good, then mysteriously open up again a few weeks later. Now, I don't generally base my impression of a business based on what the owner of the diving shop says, but he seemed like a nice guy, and it looked like in any case, I wouldn't be fixing my bike's poor tire at the shop next door. So I had to find an alternative. A quick trip to the local police box got me the information I needed: there is another bike shop about fifteen minutes down the rode. So I walked the bike down to the other bike shop, and got the tire fixed for 1000 yen. While he was at it, he also fixed the squeeky rear break. I just wish the shop wasn't a fifteen minute walk away, because that is a long walk when you don't have a bike. It is an interesting walk though. The road to the bike shop is lined with some opulent houses. It seems like a really rich and nice area. I wonder what I am doing living in the vicinity? Low ceilings. If my dad came to visit, got excited and jumped for joy, he would hurt his head. Luckily, I've never once seen him jump for joy, so I think overall this isn't really a big problem. Just about the time we got there, it was Alana and my 12th birthday. To celebrate the occasion (and perhaps try to placate the kids a bit, who were very upset at being moved all the way across the country away from all our friends!) Dad got a huge ice cream cake. That was really great, but after a slice or two, even kids start to get sick of ice cream cakes. Also, since we were in a hotel, we had no refrigerator. Dad was "forced" to eat the remainder of the ice cream cake before it melted. Sometimes being the responsible one is a tough job. Ever since then ice cream has always been one of the first meals that I have in a new place, even if it is only just a small cup or ice cream sandwich. Ice cream cakes, sandwiches, more types of food should come in ice cream form. 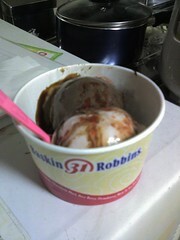 This particular evening I had just finished a beef bowl at a nearby place, and couldn't resist the Baskin Robbins. I'm positive that that place will be a bad influence on me. It is open until 10pm every night, and I usually make it home before then... Anyway, the ice cream was delicious, and the apartment has been annointed. I've been very busy lately. Last week was a brutal week at work, as I was working on writing a funding proposal for a "Young Researcher" grant. It was supposed to be in Japanse, so I wrote a draft in English, then one of the secretaries here translated some of it, and I translated the rest. While my Japanese is ok for normal email and conversations, it is really not up to snuff for academic writing. It was a humbling experience. I'll try to read more Japanese language academic papers, and try to do more formal writing to improve in this area - although it isn't clear how important it is that I can write academic style Japanese, it is something that I would like to do. It is frustrating fishing around for the words to express something, and just coming up short. A humbling experience, but a good one all around, and the proposal did finally go in a few minutes before the deadline with many thanks to Professor Kando and Ms. Homma, who helped with the translation. 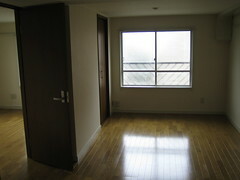 In the past few weeks I've also been looking for an apartment of my own in Tokyo. It has been a trying experience because I've been spending 12 hour days at work, and then on the weekends spend all day talking with realty agents and visiting apartments. I estimate that about half of the apartments that I was interested in ended up not being available to me because when the agent would call the owner and tell them that I am a foreigner, they would decline to rent to me. That isn't really too surprising to me, but it does make things difficult because it reduces my options. In the end, I found a place that I really like based on its location, size, usability, and to some extent, price. It is more expensive than I would like, but that's life in Tokyo. The major drawback: it is next to train tracks, so I will have a constant soundtrack of city sounds to keep me company. I don't really mind that too much though, since it somehow reminds me of my time in New York. A benefit that others might see as a drawback: it is a fourth-floor apartment with no elevator. I like the idea of unavoidable exercise. Finally, after two pretty hard long weeks of work and apartment hunting, on Sunday for the first time in weeks the Sun was out and Shining, the weather was beautiful, and I got a call from friends inviting me out to a picnic in nearby Komazawa Park. 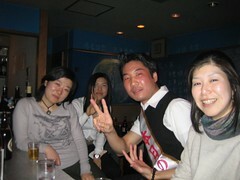 I met up with Maririn, the twins Moe and Nako, the birthday couple Gene and Emily, and soon-to-be-leaving Japan Sharon. It was really nice just sitting outside for a few hours, enjoying food, friends, cards (大公民 again) and the weather. I didn't even get sunburned. How shocking. Enjoy the pictures from my surprisingly competant camera phone. So last night We Are Scientists, one of my all time favorite bands who just happen to hail from New York, came to play the Shibuya Duo Music Exchange in Tokyo. One of the things that I've really missed since moving to Tokyo two months ago, or more to the point, moving away from New York city a year ago, is the great music scene that was available cheaply in New York. I would usually go to two concerts a month, maybe more, because it is only a $5 cover, you have a great chance to hear some local bands that might be excellent, and if you know some top-notch acts are showing up (like We Are Scientists or Bishop Allen) you probably will hear some other great bands. I really enjoy the local music scene because you get to hear new stuff, the bands have great energy, and it is just a fun time all around. 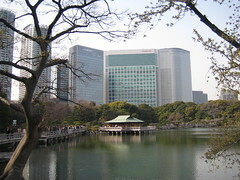 Tokyo has an interesting scene as well, but the economic structure here is completely different from New York. First of all, cover charges are usually 4,000 yen and up. Tonight's show was 6,000 yen, which is about what I spend on food in a week and a half. Typically when bands play in Japan, if they are at a "live house" then the band has promised to sell X number of tickets at 5,000 each, and if they don't they have to pay the house out of their pocket. I don't know if they get a cut of drink sales or what, but the economic structure is completely different from NYC where the bands pull people into the club / bar, and cause people to drink, making money for everyone. More or less that is my understanding anyway. What is basically means is that I am not interested in taking a chance on bands that I don't know. It is a big decision to drop 5,000 yen, so I am going to be sure that if I do, I'm going to enjoy the show. Man, did I enjoy the show last night. We Are Scientists completely rocked the house. They went on first, promptly at 7:00pm, another rarity in New York, but common here. If you have a schedule, you stick to it. The place was pretty full, and up in front the crowd was just nuts. People were jumping around for the entire 45 minute set. They closed with "The Great Escape" and it was a complete riot. People also really were pushing around and jumping during "Inaction" and many other songs. A lot of people knew the songs as well, there was just so much energy in the crowd and room. It was one of my favorite shows, up there with the last CBGBs show I saw with the Scientists and Bishop Allen. The sound systems was really nice. I was able to chat with Keith, Chris, and Michael after the show, and it was really great talking with them again. It seems like every time I check their homepage they are touring in England or Europe, so I really wonder if they ever even make it back home to Brooklyn or not. It was really great to see them again, and got me thinking about all the shows I'd seen back in New York. It was nice to see some familiar faces after a few months in Tokyo. Another funny thing about the show was that each ticket had a number on it. They let people into the club based on the number of their ticket. They actually called out numbers 1-10, 10-20, 20-30, ... and so on. I was number 417. Can you believe it? All the tickets were standing room only, so I can only imagine that the Japanese just love their concepts of structure and order even when it does not really bring any benefit to the situation. I kind of like that though. 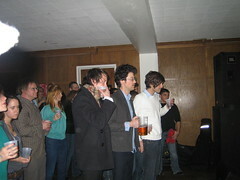 Oh, just for fun, I've uploaded my absolute favorite We Are Scientists picture of all time. It was at a show a few years back at Princeton University. This was before the Scientists went on, and they were watching Bishop Allen play. That show was also a lot of fun. I remember Keith somehow managed to knock over a lamp and was just going nuts. I've been listening to a few Podcasts ever since I got an iPod, and one of the ones that I really enjoy on the morning commute is Radio Open Source, a show that has a very wide range of interesting topics and a fairly balanced presentation of the issues. Of course, I say balanced, but the host, Christopher Lydon, is definitely a liberal kind of guy, and there are liberal leanings in the show, but I really like that they take the time to really talk about an issue over the course of the hour-long show. It is also nice that the show just about covers my door-to-door commute from home to work. Today's show just amazed me. It was about the signing statements that President Bush quietly files after signing a bill into law. The signing statements, which I had never heard of before, are supposed to give an indication of how the President interprets the bill, but in Bush's case have been used to selectively ignore portions of bills that he does not like. For the full story you should read the article by Charlie Savage explaining how Bush uses signing statements to side-step the due process of the law. It is well worth the read, and I just can not believe how far Bush has gone to sidestep the political process that makes America potentially so great. You can read more comments on the Radio Open Source page for this story. Also, congratulations to me on what is probably my first blog post that qualifies for entry into the "blogosphere". This weekend has been consumed entirely by writing and revising, with a short break in between to cook dinner. I'm trying to finish off a fellowship application by Sunday, but I also wanted to cook, something I haven't done for a long time. I decided I'd make my standard spaghetting meat sauce (mushrooms, multi-colored peppers, hamburger meat, and tomato sauce base) for spaghetti that would hopefully feed me a few times in the coming week. I also made garlic french bread (burned, as usual) and onion potatoes. These potatoes are really great, my mom has made them a few times. Basically you marinate some cut up potatoes in onion soup mix and oil, then bake them for about half an hour until they are soft. I couldn't find the onion soup mix that I usually would use, but did find some "onion consume" which worked, but the flavors were a bit weak. Still, they were pretty good. 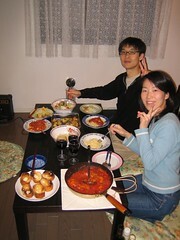 Anyway, it was nice to take a few hours off from writing to cook and have dinner with Tai and Aya. I would like to cook more often, but I'll have to learn some new tricks if I do. I've already made curry a few times, and Gyuudon would be expensive here. I might try Oyakodon soon though. Eric leaves to return to America in a few days. As his friends, we were obligated to have a going away party. Ami was nice enough to allow us to use the Joyful Time bar, and afterwards we went to sing some Karaoke. I've got proof of the bar part at least. F. and I went for a walk in Tokyo on Saturday. 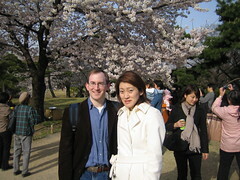 We first went to Hamarikyuu Park, and looked at some of the cherry blossoms. They are just about in full bloom now. NHK was there filming, which we later saw on TV that night. Hamarikyuu Park has a pine tree that is 300 years old. It's a pretty impressive tree. After the park, we walked through Tsukiji, and went to a place that specialized in Monjya-yaki. Monjya-yaki is like Okonomiyaki, only it doesn't thicken up as much. It was quite good. We had an order of Cod fish eggs (mentaiko, 明太子) and a mix of shrimp, octopus and something else. It was very nice. I think architects and artists would like monjya-yaki (a Tokyo-area specialty I'm told) because first you have to build a restraining wall with space in the middle out of the solid ingredients, cook it a bit, and then pour in the soupy stuff, and cook it all together a bit. Once it has firmed up a bit, you mix the stuff up and cook it through, then eat it up. Good stuff. On the way to dinner we also passed by the Tsukiji Hongwan temple, which is a very unusual temple architecturally. It looks more like it follows in Indian architectural tradition. It was closed though, so I didn't get to find out very much about it. So this weekend I am celebrating one week at work in Japan. Things are going well so far, although the commute is a bit crowded sometimes. I've settled on getting up at 6:30 to catch a 7:10 train or so, getting in to work at 8:15. Going home varies, but usually it isn't as crowded as getting to work. I really do miss my "commute" at Columbia University: about a two minute walk door to door. To celebrate, I went down to "Joyful Time", a bar in Gakugei Daigaku that my friend introduced me to. It is a nice little place, family run above their Chinese restaurant. A friend, Ami, runs the bar. It was good catching up, and I had one for E., doing research out in Osaka. I'm going to Denny's for brunch today to meet another friend. I really like Denny's in Japan. I really like Denny's in America. They are the same company, but somehow different. I wish I hadn't given up coffee, because Denny's is one of the few places I know around here that has free refills. I'll see if they have decaf coffee, but decaf coffee in Japan is very rare. My friends Ron and Michelle stopped by Tokyo for four days to visit Eric and myself. They have been travelling around the world, Manilla and Hong Kong, while on Spring break. Ron is an excellent architect, so he had an entire itenerary of buildings lined up that he wanted to see. Since their time was brief (arrive Thursday evening, leave Monday morning) time was tight. I think we made the best of it though. Over the weekend we were able to visit: Roppongi Hills, and the museum in the Mori tower. Many shops around Omote-sando, my favorite was the Prada building. The Dior building was also crazy, with a strange mirrored interior reminiscent of 2001 A Space Odyssey, and the Todd's shoe store was strange too. We also went to Kamakura, and saw the large Buddha there. Kamakura was briefly (about 150 years from 1192 until 1333) the seat of the Government in Japan. There are some nice temples there, and we walked along the cold beach for a while. The other two interesting buildings we saw are the Tokyo Forum, a large convention center near Tokyo station, and the Yokohama International Passenger port terminal. It is crazy. We also stopped off at Chinatown in Yokohama, but it was a shame that Eric wasn't around to provide some background information. I just don't know much about the history of Chinese in Japan ( particularly when compared to some. ) Finally, we also took a stroll through the Imperial Grounds, which are quite close to where I work. Speaking of work, back to it. It turns out that today (March 21st) is a national holiday, the Spring Equinox. There aren't many people around at work, which makes everything seem a little creepy. So I run my own mailserver that serves http://FuguTabetai.com/, http://MangaTranslation.com/, http://SMUGeeks.com/, and http://JevansCeramics.com/. The problem is, even after adding some extra rules to SpamAssassin, it really hasn't done a great job catching the spam, and worse it takes up a lot of RAM and CPU time on my virtual private server. The VPS is from http://RimuHosting.com/, and is really great. Look them up if you are in the market. Anyway, each email would take about 600 seconds to process. That is a long time, and worse it was really bogging down the other apps on the system, such as this blog, or the forum for MangaTranslation.com. So what I've done is turn off SpamAssassin, and forwarded the email catch-all for each domain to my GMail account. That has been working very well. Since most of my spam goes to untargetted email addressess, or aliases that I send to the catch-all, GMail catches the spam, and I just have to check my GMail account once in a while to find stuff that got through. Also, I set up some filters on GMail to mark which domain the email came from. I could take this a step farther, and have GMail forward email that makes it into the in-box back to one of my accounts here. If I did that though, I would need to add a rule to postfix to have it check the header, and deliver any GMail-forwarded mail locally. Right now that doesn't seem like much of a problem, so I'll skip that step. Where in the world are the Evans kids? My grandmother and mother have a problem. They don't know where us Evans kids are. We travel around a lot, and don't stay in one place for long. So I thought it would be a fun project to code up a PHP / MySQL web application that puts us on a Google Map. Of course, I want to make sure that if I'm going to go to all this trouble it will be a general system, so I did user sign-up and each user can have multiple maps. I have not yet added access control, which is the biggest problem: once you are on the system, anyone can put you on their maps, and all of your maps are visible to everyone. Still, it works pretty well for what I want to do, and I don't think this is going to be a well-known thing so I'm not too worried about privacy concerns. I will try to put in some access control stuff though. The code should be released under the GPLv2 once I get around to packaging it up. It is my first PHP coding project, so it is probably pretty ugly, but since I use Smarty (also my first time with that) and ADODB for database abstraction, I think it should be reasonable. Check things out: Where in the world Are the Evans Kids? I've added simple comment spam protection to my bblog. Hopefully it will keep the spam bots from getting comments in that I need to moderate. I'll put installation instructions below. On Monday the 21st I arrived in Dallas from Tokyo. The flight went well, in particular since I requested a seat with a power plug, I was able to use my computer for about four hours, and the flight seemed to go quickly. On Tuesday, I drove down to Austin to pick up Alana, and Wednesday we loaded up her can and drove back to Dallas. On the way we picked up our registration packets for the 2005 Dallas Turkey Trot fun run. 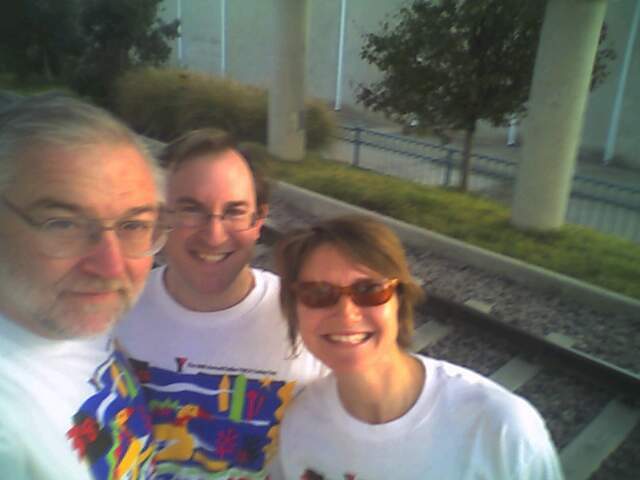 Alana, Dad, and I were going to run the 5k fun run on Thursday morning. We made it to the run, and there were 24,000 people there. It was packed. When we started our race it took about 6 minutes to get up to the starting line from where we were lined up. We all stuck together and took the run slowly, it was lots of fun. It ran right through downtown Dallas, and went by lots of historical points in Dallas. I made a Personal Best slow time at 51:50. Afterwards, we had thanksgiving dinner which was nice. Our stove broke, so mom had to run out and buy a broiler for $30, and we cooked the turkey in that. It turned out fairly well, and probably we'll use the broiler for a while since it is very expensive to get a new stove. So I turned 31 today, in Japan. This is the second birthday I've had in Japan actually. Last time I was here for a conference in 2002 I believe, and it was not memorable. 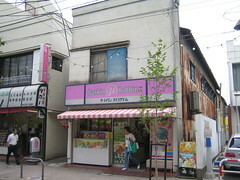 I believe that I bought myself a cup-cake at a convenience store or something. This time, I had a memorable birthday. I met F. at Shinjuku for lunch, at "La Boheme Cafe", which was quite nice. After that we walked to the governmental building, which is constantly being destroyed by monsters in movies. We did some window shopping, and then came across a blood drive. I've been meaning to give blood for a while, since I don't know my blood type and would like to have it typed. Also, I like the idea of helping out people in need. One reason I'm interested in knowing my blood type is because in Japan, people believe that one's personality is indicated by blood their blood type. I've been asked what my blood type is many times, and I never know. People are shocked. Anyway, I donated blood, and it turns out I'm type A. Sounds good to me. Now I know, and knowing is half the battle. It's a birthday I won't soon forget! Fumie and I went to a large Ikebana show at the Takashimaya in Nihonbashi on Sunday. Trip to Hiroshima, do I have to change this website to FuguTabeta.com?? On Tuesday evening I took a train from Tsu to Nagoya, and from Nagoya to Hiroshima on a Hikari Shinkansen. The picture is actually of a Kodama Rail Star train from Hiroshima because the shot I got of my Nozomi 700 Series Shinkansen from Hiroshima to Tokyo didn't turn out well. On arriving at Hiroshima, I met with Professor Hidetsugu Nanba (難波 英嗣 先生) for a very, very nice dinner. We ate at a place called きっ川, proprieter 吉川 修平 (Kikkawa Shyuuhei). It was a fresh seafood restaurant, small, and with a very nice personable atmosphere. Every dish is described and explained by Mr. Kikkawa before you eat it. I really enjoyed the dinner, it was just excellent. We also had a nice local Sake with the dinner, 雨後の月 (Ugono Tsuki). The first course was a nice Sashimi, and then there was a baked fish and a stewed fish? There was a great tempura course, and as Mr. Kikkawa explained, the anago (conger eel) was caught earlier that morning by Mr. Tiger, a famous Anago fisherman in Hiroshima that has been catching them for 40 years. It is said that he catches the most delicious Anago. It certainly was delicious. So if you are ever in Hiroshima, I highly recommend Kikkawa. The phone number there is (082) 241-0002, but you had better know Japanese if you call there. It is a small place, so reservations are recommended.